Get out of the city and head to Pagsanjan Falls on this day tour from Manila with private transportation. Accompanied by a guide, you'll take a boat ride through river rapids and past the waterfall, admiring the lush scenery. A lunch of Filipino dishes is included. Your day trip starts with pickup at your hotel by private vehicle for the roughly 2.5-hour drive southeast of Manila to the town of Pagsanjan. 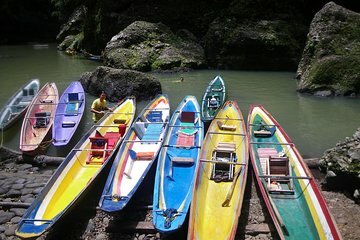 When you arrive, hop on a dugout canoe for the ride toward Pagsanjan Falls. As your boatman rows upstream, pass by the verdant landscape of vines and trees, and keep your eyes open for wildlife. After about 20 minutes, you'll reach the first fall, and then continue to the main falls. The most exciting part of the trip is the rapid descent downstream known as 'shooting the rapids.' Enjoy a little heart-pumping action as the guide navigates the boat through the choppy waters. Afterward, lunch is served, and you can change into dry clothes before the ride back to Manila for hotel drop-off. Note: You will get wet during the boat ride, so please dress accordingly and waterproof any special items.